Am I the only one who hates the end of the month? Part of my problem is that I get paid bi-weekly, but budget monthly. Since Friday I’ve had the paycheck for the first half of March’s expenses. I’m tempted to put in a big loan payment, but I can’t really track how I’m doing comparatively from month to month if I don’t hold on to those payments. It also takes what seems like forever for my law school loans to post the bill each month. If I pay it before the bill posts, it will still say I have a payment due, and while I could pay extra on it, if rather concentrate on some of the other loans now. I do have some budgeting plans for March. I have some reimbursable expenses in my February tracking, and it’s making it look like I spent $900 in my “everything else” category. If I’m being honest though I did spend a lot on “other” this month–$243 for a doctor’s visit in November*, $150+ on baby gifts, and some concert tickets for the summer. I also took out $100 to pay for dry cleaning and tailoring expenses, but I’m pretty sure only about $50 of that was spent there, and I’m not really sure where the rest of it went. I’m getting my hair done next month, but other than that, I’m going to try to eliminate “other” expenses, at least for one month. We’ll see how it goes. * I have a high deductible health insurance plan, and now have a health savings account that I put $75 each paycheck (not tracked in my net worth). That one doctor’s appointment cost me about $450 in doctor and lab fees! It was the first time I’d gone to the doctor for something other than a physical in years (since high school? ), and I don’t plan on doing it again any time soon, but I guess you can’t really plan for that–except my putting money into your HSA. Because the appointment was with my old plan I couldn’t use my HSA, but it never expires so I’m happy to save it for a rainy (sick) day. I spent the last hour or so in bed, reading blog posts while my man friend watches soccer (bogarting my computer in the process), and decided I should see if there’s been any updates to my credit score. I knew my last late payment (about seven years ago) should be dropping off sometime in the next couple of months. When I refreshed my score–BOOM! It’s gone! My score (which has been slowly increasing over time as a result of my low utilization) jumped 23 points as a result. I also have two hard inquiries and 7 open installment loans. The oldest inquiry should drop off in another couple of months (credit card I applied for in April 2012 when I was still highly irresponsible), and open loans should be down to six around the same time. I’m hoping to be down to four by the end of the year, but I don’t think either move will have too big of an effect–certainly not the 20+ point increase I saw this morning. It’s looking more and more like a house purchase won’t happen in 2015 anyway, but by the time we’re ready I should be down to four revolving loans and one (or no) hard inquiries, except for the mortgage application, whenever that happens. I’m dangerously close to the six figure mark, but I’m also thankfully one day from payday. I’ve been working my side hustle for two years. It’s a live-in position, so in addition to providing me with income, it gives me a free place to live. Since I got the official job, I’ve planned on doing it for one more year, but I have days (and weeks) when I feel like it’s way too much. I have to commute over four hours each day (and realistically, closer to five), and then I have responsibilities when I get home–which is tough because I’m only home for two hours before it’s time for me to go to sleep. My man friend tells me I’d be crazy to walk away from the income and the free place to live, but I’m exhausted. I’m also worried about the effect it has on my full time job. As far as I know right now, I’m staying, but am I crazy to keep doing this? Damn you student loans! Quick little post today: I worked from home today, because of the snowstorm. I had a call at 8am, earlier than I typically am in, and had something I was working on until an hour and a half after I normally leave, so I worked over two hours extra today–but was home and work-free over an hour early! Hopefully I’ll be able to do this more often soon enough. I get my first standard paycheck on Friday. When I say standard I mean, the one I expect will be the same going forward–will all of my deductions taken out. Hopefully with the same amount of money to spend each month I can be more consistent with my budget and, more importantly, more consistent with my spending within that budget. But for now I’m probably going to spend some money on baby shower gifts…but don’t worry, I planned for it. Still/back under $100,000! And I did pretty great this month, if I do say so myself. This is largely due to an extra paycheck because of the (in name and salary only) job switch. I paid off $2,567 in PRINCIPAL this month. 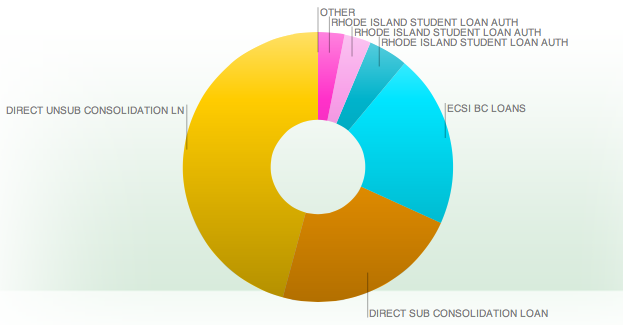 All of the “Fees and Charges” pie is interest paid on loans. I think this is smaller than usual because of the timing of my payments vs. the payments last month. I spent $632 on auto/transport this month. Some awesome things about February: my auto insurance is split into 10 monthly payments, so I don’t have a payment next month; there’s $84 I don’t have to pay. It’s a mutual insurance company, which means I’m also expecting a dividend payment of about $150 or so. My employer also just announced a discount program on car insurance, so I may look into that to save more money (though a friend of mine is my insurance broker, so I may stay where I am, and I kind of like the dividend thing). I am getting rid of my towing plan–only $20 annual, but I have AAA, so I don’t need it anymore. Knock on wood, but it’s also been MONTHS since I locked myself out of my still-running car (yes, I’ve done this more than once). February will also be the last month that my train pass will have to be purchased completely with after-tax dollars. Probably another $20 in savings each month. Lastly, I drove to the farther train station much more than usual this month, resulting in more gas and parking spending, which I hopefully won’t repeat in February. Food: $429 this month, about $300 in groceries. This is probably the smallest amount I’ve ever spent in this category. I need to reign in my pretzel purchases (maybe with more snacks for the train), but I won’t beat myself up too much. It’s pretty rare that I have a separate pie slice for health and fitness. This is from a doctor’s bill at the beginning of the month, and a prescription that I’ve submitted a reimbursement for (I didn’t have the account number information for my new health/prescription plans). I have another doctor’s bill that I’ll be paying in early February from the same appointment (one for lab testing and one for the appointment and procedure itself), so the budget there will also be unusually high. The “Other” and “Shopping” categories are what I really want to work on next month. I spent $45 at Walmart in the middle of the month, and have no idea what I bought. None. I do know that it wasn’t groceries, though I sometimes do my grocery shopping there. I spent another $40 on Amazon (light bulbs, a lint lizard that I haven’t tried yet, but is pretty necessary for some spaces in the house, and a paper towel holder to mount on my island). But seriously, what did I buy at Walmart? OH! I bought an over-the-toilet storage unit for some additional much needed storage space in my newly-organized apartment. I feel better now. The phone bill and my Netflix/TiVo are monthly bills, but tickets to a Red Sox game, and a paint your own pottery night added an extra $120 this month. I might be spending a big chunk on some concert tickets this month, so this category probably won’t be going down too much in February. 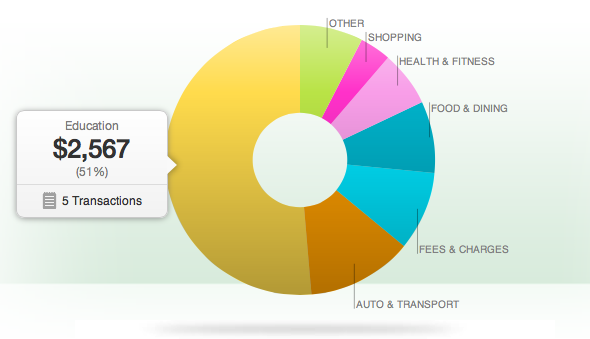 In summary, I’m pretty happy with this month’s spending and debt progress. I’ve already scheduled a loan payment for February, and I’m hoping that moving the money out of my account early in the month will prevent me from spending. I’ll post more on the February budget this week!